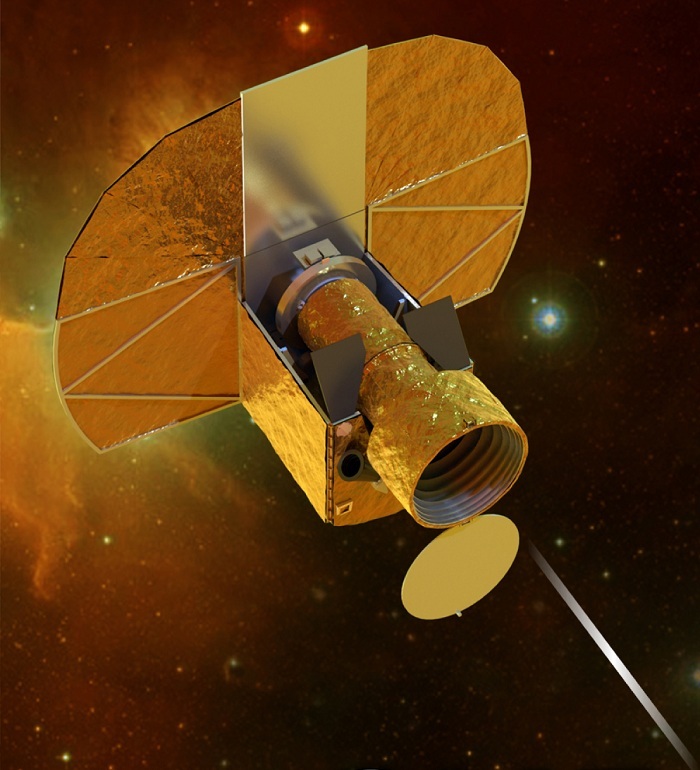 Ein Schweizer Weltraumprojekt namens CHEOPS hat den Zuschlag für die erste S-class-Mission des Wissenschaftsprogramms der ESA erhalten. Ab 2017 soll der Satellit Planeten außerhalb unseres Sonnensystems detailliert erforschen. Im Visier der neuen europäischen Mission stehen extrasolare Planeten, kurz Exoplaneten. Das sind Objekte, die außerhalb unseres Sonnensystems einen anderen Stern umkreisen. Seit der Entdeckung des ersten Exoplaneten 1995 ist deren Zahl sprunghaft angestiegen. Mittlerweile sind 850 Objekte in 669 Sonnensystemen bekannt (Stand: 14. November 2012). Die meisten Objekte sind jedoch riesige Gas- oder Eisplaneten, auf denen erdähnliche Lebensformen nicht existieren können. Aus 26 Projektvorschlägen haben Vertreter der 19 ESA-Mitgliedsländer CHEOPS ausgewählt. Das Akronym steht für Characterizing ExOPlanet Satellite – Satellit zum Studium von Exoplaneten. Gleichzeitig kreierten sie eine neue Missionskategorie: die S(mall)-class-Mission. Bei den „kleinen“ Missionen handelt es sich um eine sinnvolle Ergänzung zu den bestehenden großen („L“) und mittleren („M“) Projekten des ESA-Wissenschaftsprogramms Cosmic Vision. S-Missionen müssen mit vergleichsweise geringem Budget in Höhe von maximal 150 Millionen Euro in nur vier Jahren statt der üblichen zehn Jahre realisiert werden. Die ESA steuert zu den Projektkosten maximal 50 Millionen Euro bei. Der Rest wird von den beteiligten Partnern getragen. Die erste S-Mission des Wissenschaftsprogramms der ESA steht unter Federführung der Schweiz. Die Leitung liegt bei Professor Willy Benz vom Center for Space and Habitability der Universität Bern. „Dies ist eine gebührende Fortsetzung der vierzigjährigen Erfolgsgeschichte der Schweizer Wissenschaftler und der Industrie an der Spitze der Weltraumforschung“, so Benz. Neben der Schweiz sind auch Belgien, Großbritannien, Italien, Österreich und Schweden beteiligt. Ab 2017 soll der 200 Kilogramm schwere CHEOPS auf einem sonnensynchronen Orbit in 800 Kilometern Höhe mindestens dreieinhalb Jahre lang kleinere Planeten untersuchen. Hierzu ist er mit einem Spezialteleskop von 30 Zentimetern Durchmesser und eineinhalb Metern Länge ausgestattet. „Wir konzentrieren uns auf Sterne, die Exoplaneten in ihrem System haben. CHEOPS wird vergleichende Studien von Planeten bis zu einer Erdmasse ermöglichen und das mit einer Präzision, die sich von der Erde aus einfach nicht erreichen lässt“, erläutert Professor Alvaro Giménez-Cañete, der ESA-Direktor für Wissenschaft und robotische Erkundung. Wie spürt man Exoplaneten auf? Die direkte Beobachtung eines Exoplaneten ist äußerst schwierig. Die Wissenschaftler wenden daher indirekte Messmethoden an. 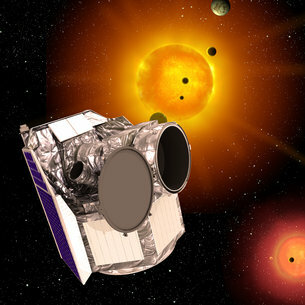 CHEOPS nutzt, wie seine Vorgänger CoRoT (ESA, 2006) und Kepler (NASA, 2009), die Transitmethode. Die Detektoren des Teleskops überwachen die Helligkeit eines Sterns mit extrem großer Genauigkeit. Zieht ein Planet vor der Sonne vorüber – ein Transit – verdunkelt er seinen Zentralstern geringfügig. Aus der Stärke des Helligkeitsabfalls lässt sich dann der Durchmesser des Exoplaneten bestimmen. Mit einer anderen Methode, der Radialgeschwindigkeitsmethode, lässt sich die Masse ermitteln. Sind Durchmesser und Masse bekannt, kann auf die Dichte geschlossen werden. Diese wiederum verrät uns die primäre Zusammensetzung des Exoplaneten – Eis, Gas oder Gestein. Viele Forscher sind davon überzeugt, dass es im Universum an Exoplaneten nur so wimmeln dürfte und demzufolge extraterrestrisches Leben unvermeidlich ist. Es ist nur eine Frage der Zeit, wann unsere lebensfreundliche Erde ihre singuläre Sonderstellung verlieren wird. Das Hauptaugenmerk der Forscher ist deshalb auf kleine Exoplaneten mit bis zu sechs Erdradien gerichtet – sogenannte Supererden. Mit verfeinerten Messmethoden, und hierzu gehört die satellitenbasierte Suche, versuchen sie diese erdähnlichen Gesteinsplaneten aufzuspüren. Vielleicht befindet sich darunter sogar eine zweite Erde? The European Space Agency’s Cheops satellite will be delivered to orbit by Russia’s Soyuz rocket, the agency said in a statement on Thursday. "Soyuz rocket operated by Arianespace from Europe’s spaceport in Kourou will boost ESA’s upcoming exoplanet satellite into space," the statement reads. The exact launch date is yet to be confirmed, the agency said adding that "the Cheops satellite is expected to be ready by the end of 2018 for shipping to Kourou, with all testing completed." 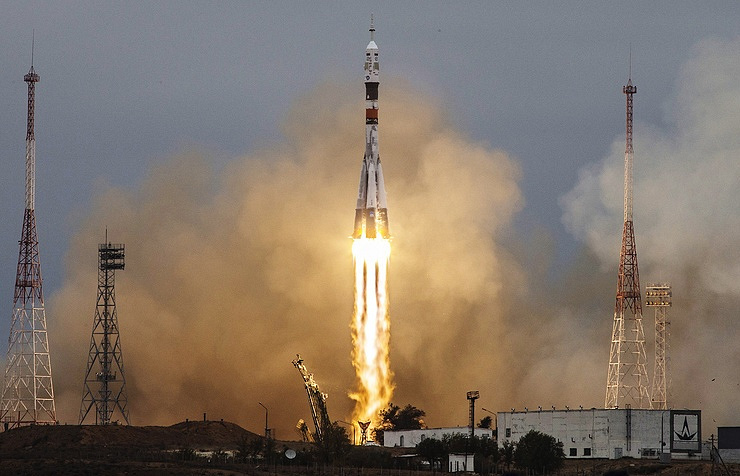 Apart from the Cheops satellite, the Soyuz rocket will also take another payload to orbit. The two will separate "into their own orbits soon after ascent." Cheops - the CHaracterising ExOPlanet Satellite - "will operate in a 700 km altitude orbit around Earth angled about 98· to the equator," the European Space Agency said. 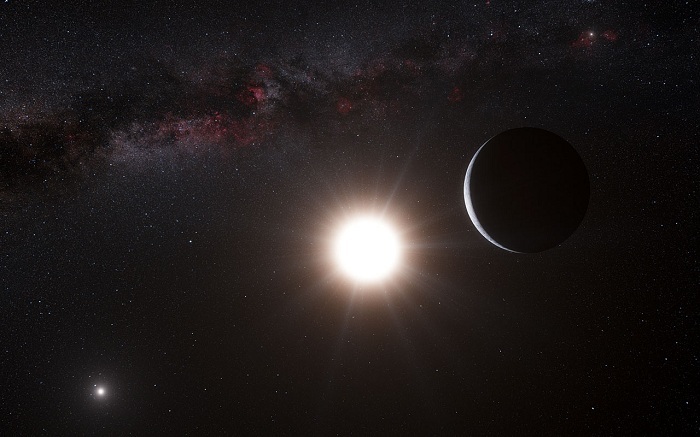 According to the agency, "through high-precision monitoring of a star’s brightness, scientists will examine the transit of a planet as it passes briefly across the star’s face. This allows the radius of the planet to be accurately measured. For those planets of known mass, the density will be revealed, providing an indication of the structure." "Cheops is an ESA mission in partnership with Switzerland and with important contributions from 10 other member states," the statement reads. In 2016, assets of the French Arianespace company were arrested which put under threat cooperation between Russia and the European Space Agency (ESA) as the company was to make payments to two Russian space enterprises. The assets were arrested after an application was filed by the Cypriot Veteran Petroleum company which used to be one of the three shareholders of the Russian Yukos oil company. The move came in connection with the ruling of The Hague arbitration court obliging Russia to pay $50 billion in compensation to former Yukos shareholders. Moscow does not recognize this decision. In October 2016, Russia’s Roscosmos State Space Corporation warned that it would stop the supplies of the Soyuz rockets until the French company pays €300 mln. In February 2017, the arrest on Arianespace’s assets was lifted. Through high-precision monitoring of a star’s brightness, scientists will examine the transit of a planet as it passes briefly across the star’s face. This allows the radius of the planet to be accurately measured. For those planets of known mass, the density will be revealed, providing an indication of the structure. These key features will help us to understand the formation of planets in the Earth-to-Neptune mass range. The mission will also contribute to ideas about how planets change orbits during their formation and evolution. Cheops will operate in a 700 km altitude orbit around Earth angled about 98º to the equator. As it circles the globe from pole to pole, the satellite will ride the terminator between day and night such that it will always be directly above sunrise or sunset. The copper-colored baffle cover of the European Space Agency's Characterizing Exoplanet Satellite (CHEOPS) in the clean room at Airbus Defence and Space in Madrid. The Characterizing Exoplanet Satellite (CHEOPS) recently passed a crucial review designed to assess the spacecraft's readiness for flight and ability to meet major mission goals, European Space Agency (ESA) officials announced on Monday (March 11). On Feb 19, "a board of experts met to draw its conclusions and declared, to the satisfaction of the project team, that CHEOPS is indeed ready for flight," ESA officials said in a statement. "All eyes can now turn to launch and in-flight operations." If all goes according to plan, CHEOPS will soar to Earth orbit this fall from Europe's spaceport in Kourou, French Guiana, atop a Soyuz rocket operated by France-based company Arianespace. The launch window spans Oct. 15 through Nov. 14. A test engineer lowers the upper part of a test container over CHEOPS in preparation for a propulsion-module leak test. "The information will enable precise measurements of the sizes of the orbiting planets to be made," ESA officials said in a different statement. "Combined with measurements of the planet masses, this will provide an estimate of their mean density — a first step to characterizing planets outside our solar system." ESA has several other exoplanet missions in development. PLATO (Planetary Transits and Oscillations of Stars), scheduled for launch in 2026, will hunt for rocky alien worlds that may be capable of supporting life. And the Atmospheric Remote‐sensing Infrared Exoplanet Large‐survey spacecraft, ARIEL, will lift off in 2028 to search for compositional links between exoplanets and their host stars. In addition, the Gaia spacecraft, which launched in December 2013 to create an ultraprecise, 3D map of the Milky Way galaxy, will likely end up discovering thousands of exoplanets by the time its work is done, ESA officials have said. Cheops will lift off as a secondary passenger on a Soyuz-Fregat rocket launching from Europe’s Spaceport in Kourou, French Guiana. 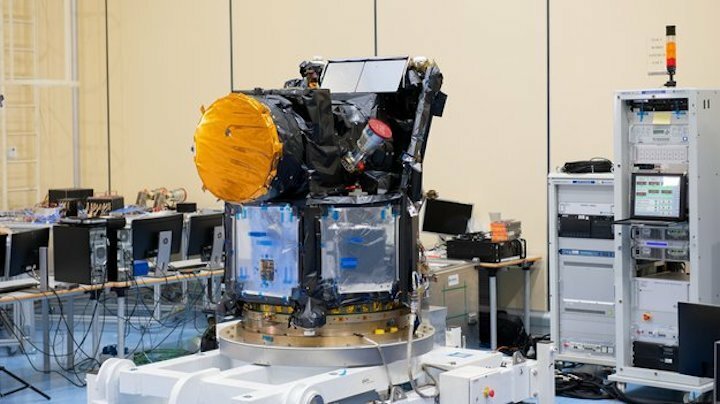 The satellite will be stored at the Airbus Defence and Space facility in Madrid for a few months before being shipped to the launch site, targeting the launch time slot between 15 October and 14 November in 2019. “We are thrilled to be launching Cheops later this year,” says Günther Hasinger, ESA Director of Science. 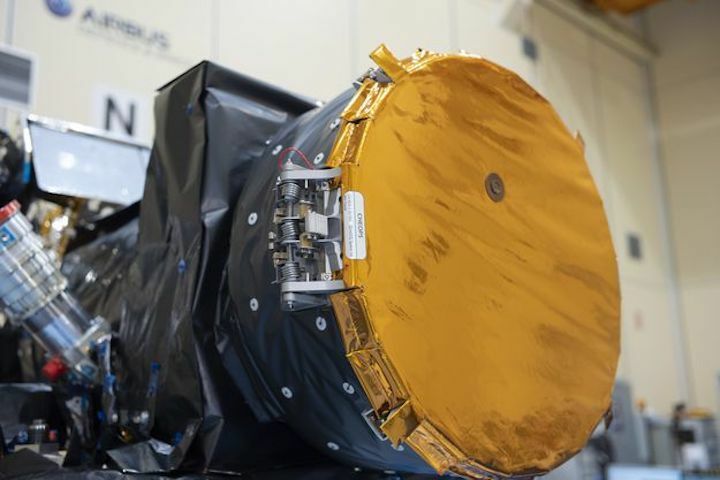 “It has taken over five years of work to get to this point, and we are within budget and fully on schedule, so we are extremely satisfied to see the satellite finally ready for flight,” says Nicola Rando, ESA Cheops project manager. “Now that we can see the launch on the horizon, we congratulate all the teams involved for their excellent work,” says Fernando Varela, Head of Space Systems of Airbus in Spain, the prime contractor for the design and construction of the spacecraft. Cheops is a follow-up mission: it will make observations of bright, exoplanet-hosting stars to measure small changes in their brightness due to the transit of a planet across the star's disc, targeting in particular stars hosting planets in the Earth-to-Neptune size range. Knowing when and where to point in the sky in order to catch these transits makes Cheops extremely efficient, maximising the time it spends monitoring actual transit events. 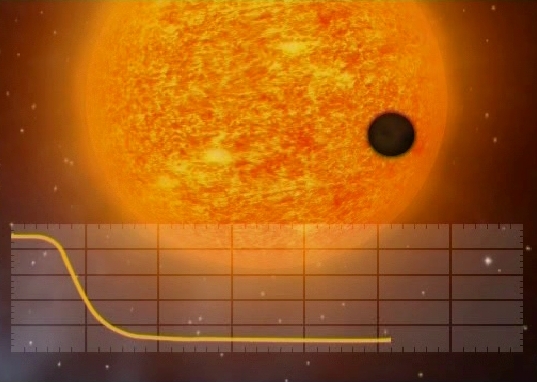 The transit observations will yield precise measurements of a planet’s size. Combined with known information about the mass of the planet, these data will make it possible to determine its density, giving us vital clues about its composition and structure, indicating for example if it is predominantly rocky or gassy, or perhaps harbours significant oceans. Observations of a list of exoplanet targets defined by the Cheops Science Team will account for 80% of the science observing time, while the remaining 20% will be available to scientists worldwide. The first call for proposals to use Cheops through the ESA-run Guest Observers Programme was published earlier this month. 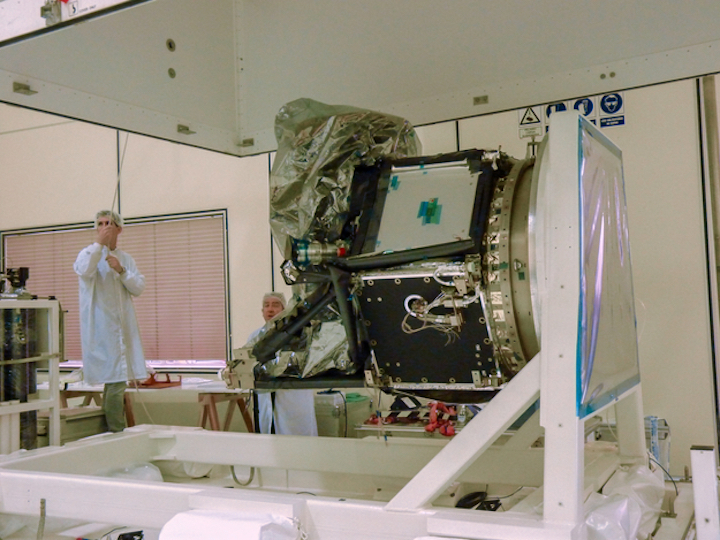 “Cheops is ESA’s first satellite dedicated to exoplanets, paving the way to two more missions in the coming decade and consolidating European leadership in exoplanet science,” adds Director Hasinger. Following in the steps of Cheops, ESA’s Plato, the Planetary Transits and Oscillations of stars mission, and Ariel, the Atmospheric Remote-Sensing Infrared Exoplanet Large-survey mission, will be launched in the late 2020s to discover and further investigate new worlds around other stars. Cheops is an ESA mission implemented in partnership with Switzerland, with important contributions from Austria, Belgium, France, Germany, Hungary, Italy, Portugal, Spain, Sweden, and the United Kingdom.